A group of 15 architectural firms led by a three person team, Re-Act [Mario Kuibus, Elena Toader and Valentin Varlan], are tackling Bucharest’s lack of tourist appeal. The reason, they say, is a lack of places to linger, bicycle, window shop or find comfortable coffee shops. One need only go to Prague to realize how far Bucharest is from the dream of a ‘pedestrianized’ old city. 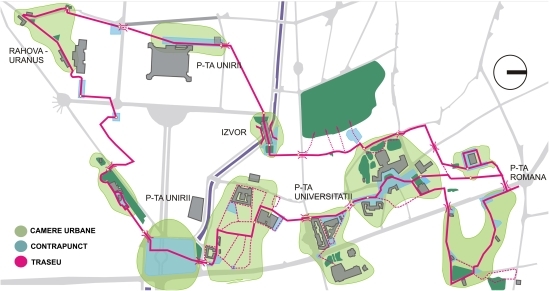 The proposed TUB would develop a circular walking ang biking circuit within central Bucharest and link architectural and green space focal points (map). Bucharest is one of the very few European capitals that lacks tourists, pleasant sites, is a place where most of the fun means malls. A suffocated town, with too few places to enjoy a coffee and simply look at the streets, with too few coquette streets to walk on. An architecture project developed by 14 architecture cabinets was put up in order to try to transform a part of the city into a magnetic experience for both tourists and the people of Bucharest. Mario Kuibus, the coordinating architect, explained for Hotnews.ro how Bucharest might look like, in case authorities would approve the TUB project. “TUB wishes to become a brand, an attempt to increase the community’s awareness of what Bucharest may become and of how the community may use its city”, says Mario Kuibus. In the project, a promenade space between the central Romana Plaza and the flower market near the former Bragadiru beer factory would be created, also including bicycle tracks designed to ease the traffic.